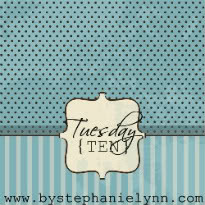 This is going to be my first week joining Stephanie Lynn over at Under the Table and Dreaming for her Tuesday Ten weekly round up party. It's a party where you can post about anything that you feel didn't warrant getting an entire post on it's own. Keep in mind, that my post took me almost a month to put together. I live a pretty boring life. So not much to post about (as you will soon find out). 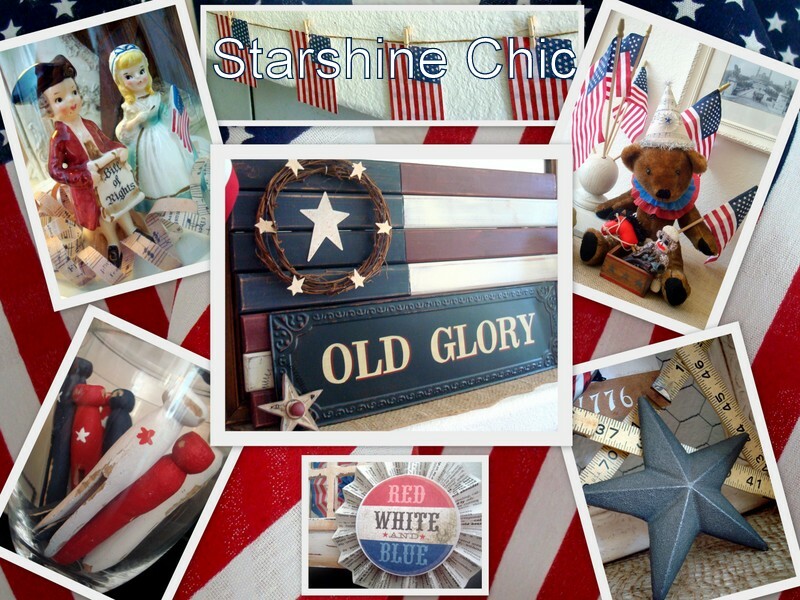 1) There is a street in my town called Starshine Dr. Too bad it isn't Starshine Chic Dr. I was pretty jazzed about this. Hubby asked if we are now going to move to that street. I told him "no". I like where we live now. But who knows what the future may bring? Do you have a street with your blog name in your town? 2) Had my first taste of Cold Stone Creamery this week. All I can say is that it won't be my last. I had the "Founders Favorite". I think that was what it was called. This is my cute niece Taylor who works at Cold Stone. That was the real reason I went there. Had to see where she is working now. What is your favorite thing to get at Cold Stone? 3) Made s'mores for the first time this summer. My big boys enjoyed this as much as the younger boys from next door. I think everyone had more fun burning their marshmallows then really making s'mores. And here is the after. Much better. And don't be looking too closely at my dead hanging baskets. We never did plant flowers in them this year. And now it is too hot to even try. 5) I finally have hydrangea flowers! I planted 2 hydrangea plants in my front yard a few years back. This is the first year I have blooms. I am so excited. This photo is from last month when they first bloomed. And this is the same flower this morning. I love the muted colors. I only really got 4 complete blooms. So I didn't dare cut them off. But I may now to try and dry them out. But I'm so scared!!!! 6) Stumbled upon a car show with hubby by accident a few weeks back in the Walmart parking lot. You know men and cars. We had to take a looksy. I had a car just like this as my first car. A 1971 Chev Camaro. Except mine didn't have the spoiler on the back and was blue which I later painted black and didn't have a racing stripe. Had white pin striping on the sides instead. Other than that, identical! See? This is me back in the 70's with my Camaro. I wish I still had this car. And yes, I had Farrah Fawcett hair. Didn't everyone in the 70's? My kitty's name was Kung Fu. This is the Camaro that I really wanted. But they were harder to find and more expensive. 7) The police were in our hood again. Seems to be a weekly occurrence. This time they actually parked in front of our house. It seems a drunk driver took our corner a little too fast & crashed into the curb across the street. Luckily he didn't hit the blue truck or the black Mustang parked in the driveway. He hit the curb just between them. The drunk backed out & tried to drive off. Hubby was trying to stop him & kept yelling the guys license plate to me to write down. But because I had not eaten yet and the rush of adrenaline from getting up too fast to see what happened, I passed out and hit the deck. Luckily it wasn't really the deck I hit, but the grass. And I didn't really black out, just went dizzy & fell. Boy did my side hurt the next day. The drunks truck stopped working just as he was in front of our house. That is why the cops are parked in front of my driveway. They ended up arresting the drunk driver and towing his truck away. I was trying to be sneaky while taking the photos. Our poor neighbors across the street. This is the 2nd time in a month that someone has taken the corner too fast & crashed. Last time the blue truck was hit on the bed by a hit and run driver who ended up getting caught. He was a 15 year old boy who didn't have his license. So the neighbor was real happy that none of their cars were hit this time. People just need to slow down when driving in residential neighborhoods. 8) What in the heck is this thing? I found this cool rusty metal thingy at the thrift store a few weeks back for a quarter. But I have no idea what it is or what it was used for. Any ideas? I'm using it as a pen holder on my end table for now. Looks like it could have been a flag holder. 9) Found this antique door knob back plate at the thrift store on Saturday for 50 cents. Hubby attached one of my antique glass knobs to it. Looks fabulous now. Now if only I had an old door to attach it to. Sorry that my photo is a bit fuzzy. The battery to my point and shoot camera was dead. So I had to use my Canon DSLR that I have no idea how to use. Someday I'll learn how. 10) And finally we have reached number 10. Whew! I guess I could have made individual posts out of each of these for as much as I talk. I was trying to take a nap and a dang fly kept bugging me. I find if I sleep with a fly swatter in my hand, the fly will leave me alone so I can rest. Give it a try. It really works. And it looks like I need a new fly swatter. The men in my household like to swat hard. This photo was actually taken a few months back, hubby thought he would be funny taking this pic. So there you have my Tuesday Ten Round Up. This was actually quite fun. I usually only post about decorating. So it was liberating to talk about something else for a change. I hope it didn't bore you too much. I hope to post my Summer china hutch by the end of the week. Summer is going by much too quickly. 2) Bet your niece will not like ice cream much longer... smells way to sweet there. 3) Once a boy... always a boy. 6) You are so right. JUST like yours! 7) Slow down? How about Dont't Drink and Drive! 8) It is a THINGY, of course! 9) Nice door plate. Wish I had a GOOD camera! xoxo Bunny Jean @ Bunny Jean's Decor and More! Great round-up. The dolphin topiary is so precious. Is that a small hedge trimmer you are using? I would love to get a small one. And, those dang mosquitos this year have been the worst ever!!! Kim, I smiled when I read your 10. 1. Yes, we have a street named after our family name. 2. Don't have a Stone Creamery here, but I do like ice cream! 3. Had smores on the beach when we were in Maine. 5. Beautiful hydrangea! Mine didn't bloom this year. 6. My hubby's first car was a Camaro, the first year they came out. He still regrets selling it! 8. Have no idea what that thingy is. You should talk to Jane. She always has amazing ideas for transforming things like this. 9. The door plate and pretty knob look great just sitting about. When my Dad brought it home it was pea green w/ a black vinyl top and he worked his magic and painted it a beautiful dark cherry red. It had low-back bucket seats with black and white herringbone fabric seats. I loved that car! I wish I had taken more pictures of it. I love your dolphin topiary! And I have to laugh of your "hood" pictures. We are on the main street in our small town and we see this stuff every day. P.S. I'm having a blogiversary giveaway of a children's book I made that you might like for your grandchild. Just leave a comment on my latest post to enter! Saw this on pinterest and it reminded me of you. I was wondering if I can talk you into adding that new feature where your readers can sign up to get your posts in their emails? Pretty please...lol. That way I can't miss any of your posts since they will be in my inbox!